Interior designs that include the use of natural stone are becoming more popular thanks to the affordable pricing on bulk orders of granite, marble, and travertine. However, finding the highest quality stone materials can be difficult. Many retailers offer a small variety of transition thresholds to match the style and color of window sills and floor tiles, but unless these different products are manufactured from stone taken from the same geologic formations, installers and their materials supplier are taking a huge risk. Stonexchange is a direct importer and distributor of carpet-to-tile transition thresholds. We own and operate our own manufacturing center overseas, and we guarantee the finest quality products at the lowest possible price. Located in Miami, Stonexchange offers building contractors, flooring product retailers, and home improvement outlet stores the best deal on full-crate orders of natural stone. Floor saddles provide a safe transition between two different surfaces, specifically carpet and tile. Usually placed in a doorway, a transition threshold is meant to act as a moisture barrier as well as an eye-catching room accent. Designers often put an emphasis on horizontal and vertical lines, meaning that window sills and window frames, baseboard, and thresholds will stand out and highlight the overall appearance of the room. The use of natural stone for these accents is popular here in the Miami area. Both granite and marble are prized for their beauty as well as their functionality and long-lasting value. The trick is to procure the highest quality product at wholesale prices. Natural stone thresholds are manufactured from granite, marble, travertine, or engineered veneer. These products must be expertly crafted, with perfectly straight ends, parallel sides, and gently rounded bevels. Their thickness must compensate for plush carpets while at the same time not resulting in a tripping hazard for pedestrian traffic. Stonexchange is the reliable source for premium quality transition thresholds made from natural stone. We operate on a bulk order principle, meaning that our clients are usually construction companies and area merchants specializing in building materials for large-scale development or renovation projects. Our products are available in the most popular color shades, guaranteed to match the instructions specified in building or design plans. We maintain a large inventory of product at our Miami-area warehouse and distribution center. We can fill an order for dozens or even hundreds of beautifully crafted transition thresholds and have the shipment on its way to the client in one or two business days. A subcontractor charged with the job of placing numerous thresholds – usually three or four different styles – in a large resort development, hotel renovation, or condominium complex will find that Stonexchange offers the best price on bulk orders of this product. Whether it be standard double-bevel floor saddles or the popular single or double Hollywood style, we have the right product at truly wholesale prices. Take a moment to check out our outstanding product line, and decide for yourself if Stonexchange is the natural stone distributor you’ve been looking for. Our Absolute Black Granite transition thresholds are finely polished and are available in both single-and double-bevel styles. They are virtually spot-free and are recommended for projects calling for the use of Galaxy or other dark-tone granite. These natural stone floor saddles are manufactured in a standard 36-inch length and are sold in crates of 50, 100, or 200 pieces depending on style and width. Customers can order Absolute Black Granite thresholds in standard double-bevel, single Hollywood, or double Hollywood style. These beautiful saddles come in a variety of widths ranging from 2-6 inches. Black granite thresholds look their best when used as a transition between neutral or light shades of carpet and tile. This natural marble stone is cream/beige in color and easily replaces thresholds specified as Botticcino or Bursa Beige. A medium shade transition saddle looks its best when there is matching neutral or medium shade carpeting or tile. Our Crema Sahara Marfil floor thresholds are expertly polished and are delivered ready for immediate installation. Crema Sahara Marfil marble thresholds come in a standard 36-inch length, are available in standard double-bevel, single Hollywood, and double Hollywood bevel. The pieces can be ordered in widths of up to 6 inches. We offer this fine product in full crates containing 100 individual pieces. Our stock of Nuevo White Carrara marble thresholds are available in all three of the styles mentioned above. These are among our most popular marble products, especially for construction projects here in the Miami area. Nuevo White Carrara is extremely light in color with a moderate amount of dark streaking. This style is a perfect replacement for Alabama, Cherokee, Georgia, or Vermont marble. Nuevo White Carrara thresholds are available from Stonexchange in a variety of widths ranging from 2-6 inches. The standard length is 36 inches, and the product is packed in crates containing 100 individual pieces. Our double Hollywood bevel Nuevo White Carrara transition saddles are often chosen as the product used for hotels, hospitals, resort complexes and commercial buildings because they work extremely well in areas of high pedestrian traffic. 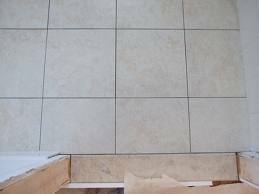 We also carry standard double-bevel thresholds made from travertine. These pieces are chosen from the highest grade limestone deposits, have been expertly honed and filled, and are made available in various widths and styles. Our travertine thresholds are medium shade and will match any light noche or beige travertine tiles, window sills, or wall coverings. Our engineered white stone thresholds are the product of choice among builders needing an extremely light-shaded, very bright white stone product for high-end projects. This marvelously fabricated stone is a combination of glass and specialty resins, has no spotting or streaking, and is available in standard 36-inch lengths. Engineered White Thazoz stone from Stonexchange is delivered in full-crate or full-pallet quantities, with a minimum order requirement of between 50-200 pieces depending on style. Stonexchange advertises standard length and width thresholds because these are the most popular and most sought-after sizes in the building industry. However, we are aware that many projects, especially those involving the installation of transition saddles in business properties, call for the use of irregular widths and lengths. We therefore offer custom-sized thresholds that our manufacturing facility produces on-demand. Stonexchange does not keep a regular inventory of these odd-size pieces, but we will fill such order requests promptly. A lead time of up to 60 days can be expected for non-standard size thresholds, but our company does not charge a service fee or inflated per-piece cost to our customers. Remember, our products are manufactured specifically for distribution by Stonexchange, and we are therefore in a position to offer our customers the same low wholesale price on custom-fabricated natural stone products. All of our standard and non-standard size thresholds meet ADA requirements for pedestrian safety. When properly installed on a suitable substrate material, the bevels will be gentle and the top surface of the saddle will not rest unusually high above the level of the carpet or tile. Non-standard size thresholds can be ordered with longer Hollywood style bevels, lengths exceeding 36 inches, and widths exceeding the standard 6-inch. Our customers include independent installers and larger construction companies. Thresholds are often specified as granite or marble in the building instructions, but the actual style and color shade is often left up to the property owner. This means that although the contractor puts in an initial bid well ahead of construction and interior design, product must be available in the various styles advertised by the developer. It is a relief to our clients that our products are available 365 days a year and that our Miami-based distribution center is conveniently located for delivery to sites all across the southern part of Florida. We use reliable courier or freight companies that are chosen for their expertise in delivering fragile stone products. We give our customers an immediate price quote, process the order, and deliver the crates or pallets directly to retail stores, construction job sites, or commercial storage facilities. Stonexchange is a true wholesale operation. We do not purchase our product from brokers or outside manufacturers. Our products come to you directly from quarries and fabrication centers owned or partly owned by us. We can guarantee the lowest possible price on bulk orders of carpet-to-tile transition thresholds, and our product quality is second to none. Contact us today and get all the details on our manufacturing process, warehouse inventory, and regional delivery of our natural stone products. Remember, Stonexchange is in business to offer commercial clients the absolute best deal on the world’s most popular styles of granite, marble, and travertine. Start saving money by getting your natural stone thresholds directly from the manufacturer.